Popular understanding has it that Wicca, also known as witchcraft or the "Old Religion," dates all the way back to Paleolithic times, echoing goddess worship, sacred festivals, and holy places. Those overtones are certainly heard in the twenty-first-century version, but Wicca today is really part of the neo-pagan, or "new pagan," movement. Many people have reacted strongly against the monotheistic, patriarchal organizations and institutions comprising Western religion. They have tried to rediscover a spirituality that connects humans to their environment, rather than separating them from it. They have tried to find the feminine face of the divine, rather than just the masculine. In 1921 Margaret Murray wrote The Witch-Cult in Western Europe. It proposed that witchcraft was a remnant of pre-Christian religion, barely surviving many purges but still continuing in many disguised traditions that the church "baptized" and adopted. Christmas and Easter are only two examples of Christian customs loaded with preChristian symbols (see Paganism, Calendar of). By the time witchcraft laws were finally repealed in England in 1951, the Wiccan movement was well entrenched. Gerald Gardner (1884-1964), considered by some the father of modern Wicca, had already published his novel, High Magic's Aid, based on his experiences with Wicca, and in the 1950s he followed with the nonfiction Witchcraft Today and The Meaning of Witchcraft. Also influential was Robert Graves's (1885-1985) The White Goddess, published in 1959. Wiccans believe that all nature is sacred and that human beings, rather than being nature's rulers, are very much a part of nature. Typically, Wiccan worship revolves around the goddess, but both male and female attributes comprise the sacred presence. The goddess is pictured in three forms—maiden, mother, crone—and these forms are seen monthly in the phases of the moon as it waxes and wanes. The male horned god, lord of the animals, is also an important metaphysical deity, born each year at the winter solstice. In the spring he is the lover and mate of the goddess, but he dies each fall, symbolized by the cold and dark of winter. Wiccans form covens, small groups of typically twelve or thirteen people who meet to celebrate rituals and festivals. A typical meeting consists of "casting the circle," or defining a sacred space; purification rituals involving the four elements of fire, water, earth, and air; and the use of sacred implements such as the chalice, wand, and blade. Participants engage the ancient power of the dance and chant to form a "cone of power," channeling the collective power of the group to effect healing or transformation. Wicca has provided a much-needed avenue in which to recover feminist spirituality and a healthy antidote to patriarchy. Goddess worship, emphasizing the sacredness inherent in Earth and nature, has even been recognized by scientists who coined the term Gaia Principle (see Gaia Principle), thus invoking the name of the goddess, "Mother Earth," to describe how things really work on this planet. It is hard to know how many people practice Wicca today. The religion is, by design, not inclined to publish membership lists or hold annual meetings. But in 1993 the Parliament of the World Religions conference held in Chicago saw a very visible Wiccan presence. That presence sparked the formation of many more covens around the country. Many beginners are still feeling their way. It's not like there is a Wiccan manual to follow, though there has been talk in the Unitarian Universalist Association of training Wiccan clergy for military chaplaincy. But as experiences are shared and Wiccan wheat is separated from charlatan chaff, it is certain that the movement will continue to grow, develop, and gain acceptance. Wicca is the preferred word for "Witchcraft" with most Witches today, since it does not carry the negativity associated with the stereotypical witch promoted by Christianity. It denotes the positive, nature-oriented Pagan religion derived from preChristian roots. The origins of the word are frequently debated. Gerald Gardner was the first to use the word in recent times and, as with his form of the Old Religion, it has become the norm, although Gardner spelled it with one "c"—Wica— while most Witches today employ two: Wicca, or Wicce (f). "witchcraft"; wiccian, "to use witchcraft." Other sources include the Anglo-Saxon wita/io/ge (m), "a sage or wise man," and witeg/a or witga, "wise man or prophet." In early Britain, the king had a national council of wise ones known as the Witan (King Alfred and his Witan made peace with Guthrum). This Witan was composed chiefly of eorls, or nobles of hereditary rank, together with gesiths, or professional warriors. As a lawmaker, the king always acted with his Witan. There are many instances to show that this Witan was also able to elect a king. Edain McCoy says, "Witta, the Irish Gaelic term for the Anglo-Saxon word Wicca, is one of the Irish names of the craft." 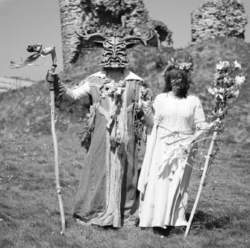 Two Wiccans celebrate Beltane in Clun, Shropshire, England. If you don’t believe in witches, you are woefully out of date. Experts on religious trends predict that Wicca will be the third-largest religion in the United States by 2012. According to the U.S. Census, the number of individuals professing to be Wiccans rose from 8,000 in 1990 to 768,400 in 2002. Authorities on contemporary American religious trends predict that Wicca soon will be the third-largest religion in the United States. Since the Middle Ages, witchcraft, the “Old Religion,” and Wicca, the “ancient craft of the wise,” have been used interchangeably to designate the same pagan nature religion. This interchangeable usage has recently declined, however, as contemporary Wiccans debate whether Wicca as it is practiced today can truly be traced back to ancient times or instead developed as new natural religion in the early nineteenth century and gained momentum in the mid-twentieth century. Wicca accepts the doctrines of reincarnation and karma but rejects the idea of original sin. Through a series of incarnations, the spirit seeks to perfect itself by learning to live in ever-increasing accord with nature’s laws. Evil consists of the conscious rejection of the good and the conscious effort to embrace the dark side. Humans are free to choose good or evil but can lose this freedom through the constant and prolonged choice of one path or the other. Witches seek the good by willing the good, while those who practice Black Magick or who follow the “left-hand path” have yielded control of their thoughts and actions to the flesh, that part of human nature motivated solely by the search for satisfaction of instinctual and egotistical demands. The striving for evil inherent in the instinctually ordered flesh must be controlled and directed by the will in such a manner that its needs are satisfied, but not at the price of others’ well-being and existence. For many years, Margaret Murray’s Witch-Cult in Western Europe (1921) was the definitive work on witchcraft and undoubtedly inspired the revival of the craft in the modern era. Murray’s thesis was that witchcraft hearkened back to an ancient, pre-Christian goddess worship and continued forward in unbroken lineage to contemporary times. The witch craze that seized Europe from the fourteenth to the seventeenth centuries and led to the persecution and deaths of thousands of women who practiced witchcraft was an expression of the contempt of the patriarchal establishment for an ancient, woman-centered religion. In her opinion, based on her extensive research, the practice of witchcraft had nothing to do with the worship of Satan, an entity of evil that had been created by Christianity. Gerald Gardner is regarded as the founding father of all modern expressions of Wicca. Born in Lancastershire, England, on June 13, 1884, Gardner spent a great deal of his adult life as a British civil servant and as a plantation manager in Southeast Asia. In the autumn of 1939, after he had returned to England, he discovered witchcraft and was initiated by Dorothy Clutterbuck, a hereditary witch and high priestess of a New Forest coven, into a secret group of Wiccans (throughout his writings, Gardner always referred to the magical religion as Wica, rather than Wicca, as the word is usually spelled today). In The Meaning of Witchcraft (1959) Gardner wrote that he was nearly through the initiation to become a witch when it struck him that he had become a part of the great circle of the Old Religion that had existed since time immemorial. To be a Gardnerian witch thenceforth meant being a witch who had undergone an initiation that could hearken back to Gerald Gardner and through him to an unbroken lineage that had been hidden and kept secret by sacred oaths and the solemn practice of holy rituals. When the last witchcraft laws were repealed in Great Britain in 1951, Gardner wrote Witchcraft Today (1954) and thereby incurred the wrath of many traditional members of Wicca. Gardner protested that he had not revealed any secrets protected by the oath that he had taken during his initiation, and he announced his intention to publish more books about Wicca and to become the spokesperson for contemporary witchcraft and the pagan community. From that time on until his death in 1964, Gardner developed his own tradition, which might be described as a combination of ritual and ceremonial magick, French Mediterranean witchcraft, and the ideas of such fellow witches as Doreen Valiente. In 1944, after the death of her first husband at sea during the war, Doreen married Casimiro Valiente and acquired the name by which she would be known for the rest of her life. On Midsummer’s Eve, 1953, she received the first degree of initiation into Wicca by Gerald Gardner, who at that time was operating a witchcraft museum on the Isle of Man. Although Gardner claimed that his “Book of Shadows,” a collection of spells, sacred writings, thoughts, and goals, had been compiled from remnants of the Old Religion, Doreen, whose witchcraft name was “Ameth,” recognized rites and rituals copied from ancient lore, a few bits and pieces from Freemasonry, and passages from works such as Aleister Crowley’s Gnostic Mass. Rather than being humiliated or angered by his student’s accusations, Gardner invited her to improve upon his fragments of the old and the new. Doreen accepted the challenge and replaced nearly all of the Crowley and Masonic excerpts with the thoughts and inspirations that she had received from her own mystical experiences since childhood. The reconstruction of the “Book of Shadows” achieved by Doreen Valiente gave the practitioners of Wicca a practical and workable system. When Raymond Buckland emigrated from England to the United States in February 1962, he introduced contemporary witchcraft into the United States. Born in London on August 31, 1934, Buckland was Romani (Gypsy) on his father’s side of the family, his grandfather having been the first to settle into a permanent home and stop traveling the roads. His mother was non-Gypsy—gaujo—making Raymond a half-blood, or poshrat. Buckland’s reading had drawn him to witchcraft, and he was greatly influenced by Margaret Murray’s books and by Gerald Gardner’s Meaning of Witchcraft. He entered into a mail and telephone correspondence with Gardner and eventually was introduced to Gardner’s high priestess, Lady Olwen (Monique Wilson), who initiated Buckland into Wicca in Perth, Scotland, in December 1963. Buckland met Gardner just before the initiation, and he became Gardner’s spokesman in the United States. Buckland’s craft name was Robat, and together with his wife, who became the Lady Rowen, he established the first contemporary witchcraft coven in the United States. With Gardner’s books going out of print, Buckland wrote his first book on the craft, Witchcraft from the Inside, published in 1971. Buckland then dedicated his life to correcting misconceptions about Witchcraft, speaking and writing articles on the subject. Inspired by Gardner’s museum, Buckland gathered artifacts over the years and in 1966 opened America’s first museum of witchcraft and magic, initially in the basement of his home, then in an old Victorian building in Bay Shore, Long Island. By 1973 he had founded a new branch of the craft, taking nothing from Gardnerian sources (because of his oath to that tradition) but writing all new material. He based it on a Saxon background and called it Seax-Wicca, or Saxon witchcraft. Today the Seax-Wicca tradition is found worldwide. In 1983 Buckland married Tara Cochran, and in 1992 the couple moved to a small farm in Ohio to work as Solitaries. For his solitary practice, Buckland drew mainly on Seax-Wicca rites, together with aspects of Pecti Wita (a Scottish tradition inspired by Aidan Breac and developed by Buckland). A prolific author, by 2005 Buckland had nearly forty books published, with more than a million copies in print and translated into twelve foreign languages. In 1968 Gavin Frost (1930–) and Yvonne Frost (1931–) formed the first Wiccan church, the Church of Wicca, and lobbied for their cause until, in 1972, they gained federal recognition of witchcraft as a religion. In 1985 their arguments convinced a federal appeals court that Wicca was a religion equal to any other recognized as such in the United States. The Frosts’ School of Wicca, also established in 1968, became the first craft correspondence school and continues to publish Survival, the oldest Wiccan newsletter in circulation. The School of Wicca has brought more than 200,000 people to the craft and has handled as many as a million requests for information in a single year. Authors of the controversial Witches’ Bible, the Frosts have coauthored more than twenty other books and have appeared on hundreds of national television and radio shows to promote Wicca. Since 1972 Gavin and Yvonne have lived under a vow of poverty, turning over all their material possessions to the Church of Wicca. Philip Emmons Isaac Bonewits (1949–), priest, magician, scholar, and author, is known for his leadership in modern Druidism and for his serious scholarship in the fields of the occult, metaphysics, and witchcraft. Bonewits was ordained as a Druid priest in October 1969, and in 1970 he graduated with a bachelor of arts degree in magic and thaumaturgy from the University of California at Berkeley, the first person to do so at a Western educational institution. The media attention around Bonewits’s degree resulted in his obtaining a book contract, and in 1971 Real Magic was published. In 1973 Bonewits moved to St. Paul, Minnesota, where he assumed the editorship of the neopagan journal Gnostica. During this same period, Bonewits combined interests with a number of Jewish pagans and created the Hasidic Druids of North America. In 1973 Bonewits argued that the alleged antiquity of Wicca could not be supported by historical data and that the craft as it was practiced in the twentieth century did not go back beyond Gerald Gardner and Doreen Valiente—no earlier than the 1920s. Although such views were extremely controversial at the time, many scholars within the field have since acknowledged that neopagan Wicca may well be a new religion, rather than the continuation of an old one. Samhain begins the year and occurs near October 31, Halloween on the Christian calendar. Contrary to numerous misconceptions, Halloween is not a witches’ holiday, but an old Christian celebration of the dead. Samhain honors the harvest, the time when the crops “die” to become food for the winter and when the veil between worlds becomes very thin. Yule marks the winter solstice and is celebrated near December 21, the longest, darkest night of the year. Candlemas, observed on February 2, is the festival of the goddess Brigid. Spring equinox occurs around March 21 and is a powerful time to practice magic. Beltane, May 1, celebrates love and oneness. Summer solstice, occurring around June 21, is a time of power and a time to pay homage to the deities of nature. Lammas, August 1, recognizes the signs that harvest is near. Fall equinox, near or on September 21, celebrates a balance between light and dark, night and day. It is also a time to prepare to embrace the many mysteries of the goddess as she oversees the winter months of cold and darkness. Some Wiccan traditions also celebrate, in much smaller gatherings, Esbats, which correspond to the phases of the moon. There may also be special-purpose gatherings limited to the members of a coven who meet to deal with a problem or issue specific to the group or an individual member. When most Wiccans hold an Esbat, they generally meet in a group of thirteen—the membership of a coven. Although some Wiccan traditions permit larger numbers to participate in the Esbats, most maintain the old practice that if a coven exceeds thirteen, it should split off into another group. During the eight Sabbats, however, many covens may meet together to celebrate the festivities. The Esbats are considered sacred events, and for most traditions they occur in an outdoor setting, in a place where the coven members can touch the earth. One of the coven, usually the high priest or high priestess, draws a large circle on the ground while walking clockwise. The instrument used to etch the circle is generally a wand or the ceremonial athame (dagger), and once the circle has been made, the four cardinal directions (and often Above and Below) are invoked by the high priest or high priestess. Some covens perform this rite of invocation in front of a small portable altar. The celebrants also invoke the names of the goddess and the god and various nature entities. Some Wiccans conduct this ritual “skyclad” (naked), while other prefer to dress in gowns or other special costumes. The area encompassed by the circle of celebrants is considered a holy space representing an altered state of conscious that exists between the material world of time and space and the immaterial world of limitless being. The circle of combined psyches also serves as a receptacle of magical energy that will build its strength until it is released in what is known as the “Cone of Power.” When the Cone of Power attains the energy necessary for the purposes desired by the coven, it is released and sent out to perform the various tasks assigned to it by the wishes of the celebrants. Once the power has been released, some traditions pass a chalice of wine and small cakes around the circle while the practitioners pronounce “Blessed Be” to one another. Once the ritual has been completed, the circle is formally opened by members walking around the perimeter in a clockwise direction. If a coven meets for an Esbat at the time of a full moon, it will quite likely engage in the ritual known as “Drawing Down the Moon,” in which the spirit of the goddess and god are “drawn” down into the physical bodies of the high priestess and high priest. During the time that the deities have entered the high priestess and high priest, they are considered by the coven members to be the goddess and god incarnate. While this spiritual possession is taking place, the high priestess and high priest relay teachings and knowledge to the coven and may even answer personal questions relevant to the needs of individual members.